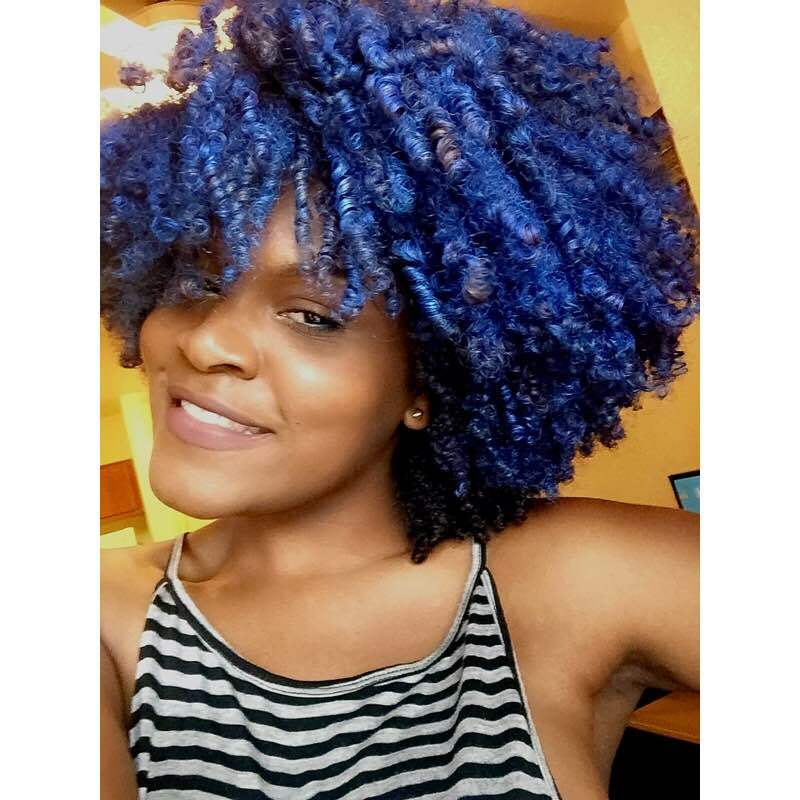 Amanda Jean- "Temporary color is a fun and simple way to jazz up your fro!" My name is Amanda Jean Jacques. I am from the beautiful Caribbean island of Dominica. I come from a family where hair has always been a big deal. We all had lots of hair; my mom, dad and my older brother and sister all had locs, but the decision was never forced on us. I am so thankful we were able to make our own decision because I was always, and still am too spontaneous to make such a permanent decision with my hair. I have been natural all my life. Having natural hair back in the Caribbean has always been encouraged and appreciated. As a young girl, I can remember looking forward to my next hairstyle for school the next day. I was never too fond of the actual process of getting my hair done, but I always loved the end result. My love for my natural hair didn’t come until later in life. I was always fond of my hair, but I never really appreciated its true beauty until I became more confident in my skin. 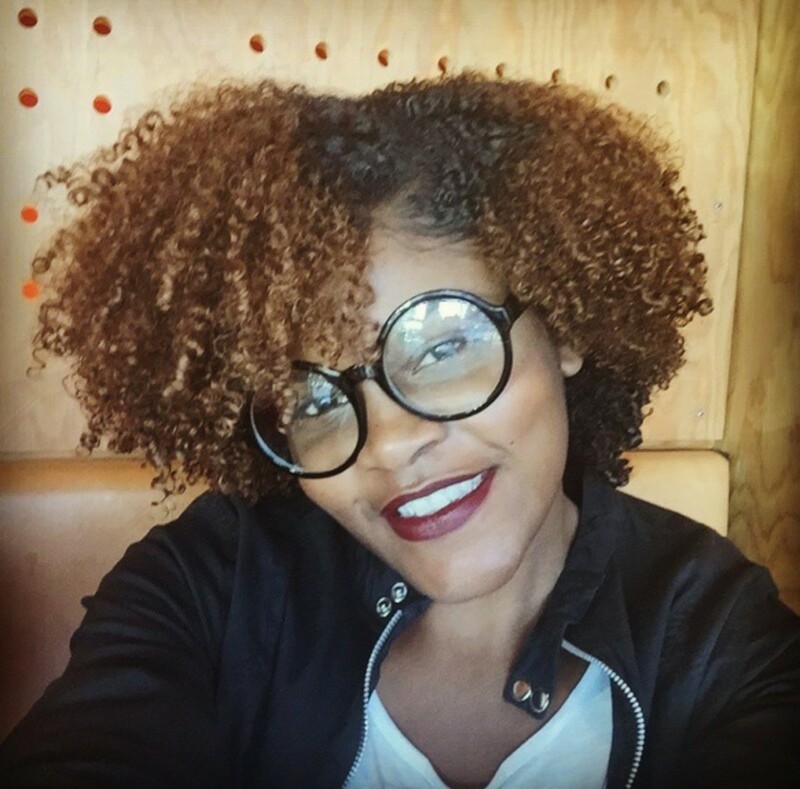 It wasn’t until my early twenties, when I began to shed my insecurities that I developed an overwhelming pride in my hair, skin and my culture. About two years ago my mother was diagnosed with breast cancer and she had to go through chemo and radiation therapy. She made the decision to cut her hair off before it started to fall out, and about two weeks later I surprised her by cutting off all my hair as well. I had made the decision to not let her face her insecurities alone, she was not happy about it at first but after a while she came to appreciate. I actually had to do some research to answer this question because I have never been into hair typing. Before I big chopped I would flat iron my hair at least once a month, so over the years my hair texture changed and had a looser curl pattern (3b-3c). Now that I have completely stayed away from heat, I would definitely say my natural curl pattern is somewhere between a 4a & 4b. I absolutely love how versatile my hair is. I’m sure that’s a favorite for all naturals. I love that on first day hair I get more of a tamed curl and by day three I wake up to a big curly fro! I love that each curl is different depending on the day and what product or styling tools you use. Sharing my hair growth journey with my mom and seeing her gain her confidence back as her hair grew was by far the best and most memorable part of my hair journey. I also had to face a lot of my own insecurities when I cut my hair. For a long time my hair was my clutch, and so was my mom’s. We both went from having really long hair to almost nothing. It wasn’t easy but we got through it. 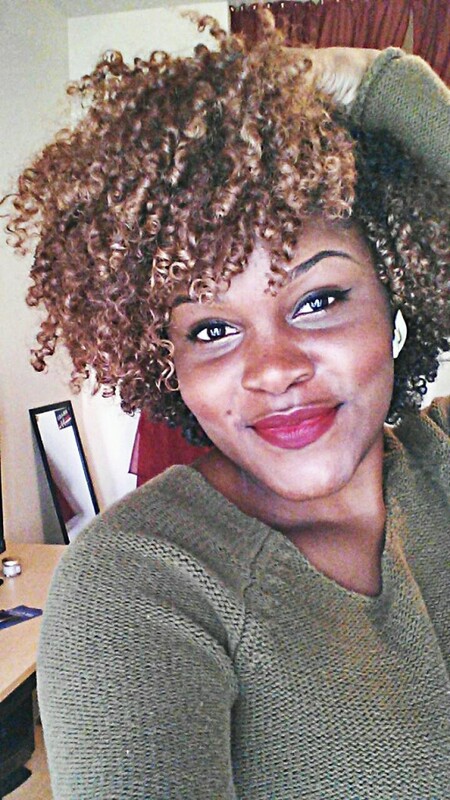 My go-to hair style for my short hair was finger coils. Those lasted about three to four days. Now that my hair has grown much longer, I live for wash and goes. I have tried twistouts in the past, but I can’t seem to get the definition I like. Plus, it is too time consuming. I’ve been experimenting with color in the past year and a half. I went from blonde to red, now I’m rocking blue hair. I love how color can spice up and instantly bring some life into any hairstyle. No one in my family was happy when I cut my hair off, but they all slowly started to warm up to the idea. As for everyone else, I kept my reason for cutting my hair private so most people at school just thought I did it for style purposes. They weren’t too happy about seeing my hair gone but they loved my cut and I got many compliments on my TWA. I have always been a minimalist when it comes to products and styling. As a college student, I’d much rather go spend my money on some good food than to drop thirty bucks on an 8 oz bottle of styling cream. In my search for effective and affordable products I’ve come to rely on the Aussie Moist products to shampoo and condition my hair, and ecostyler gel as my styling product. I also love to mix peppermint oil with any other essential oil because I am obsessed with the tingling feeling it gives. My favorite YouTuber by far is Taren Guy. She was the first one I discovered and I’ve been a loyal follower since. Her energy and vibe is addictive. Any tips on staying confident with shorter hair? During my twa phase I became addicted to lipstick and sunnies. Those are two must haves for my ladies with shorter kinks. You can’t go wrong with a bold lip and a pair of shades on. What advice would you give someone who wants to experiment with color? I would say just do it! 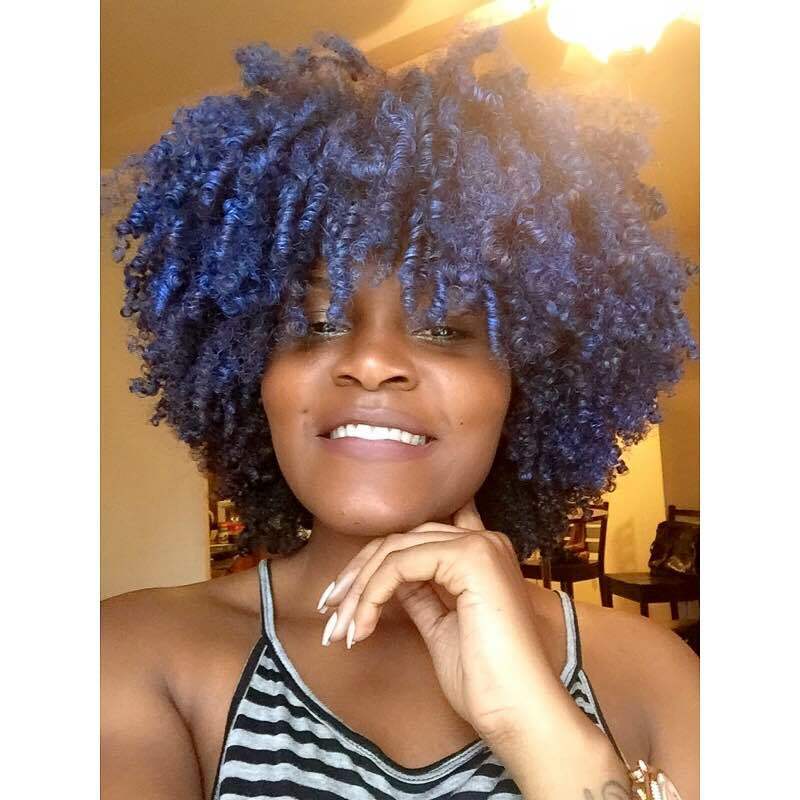 It took me a while before I decided to experiment with color but I found myself getting bored with my hair and needed to try something new and bold. There are so many options to choose from I was literally in sally for an hour trying to decide. When I lightened my hair I used and ordinary, out of the box dye. But for my brighter colors I wasn’t ready to commit all the way so I went out and bought some temporary hair mouse and spray and just went crazy. It was very simple,the color slowly fades out during the week and completely washes out in the shower. 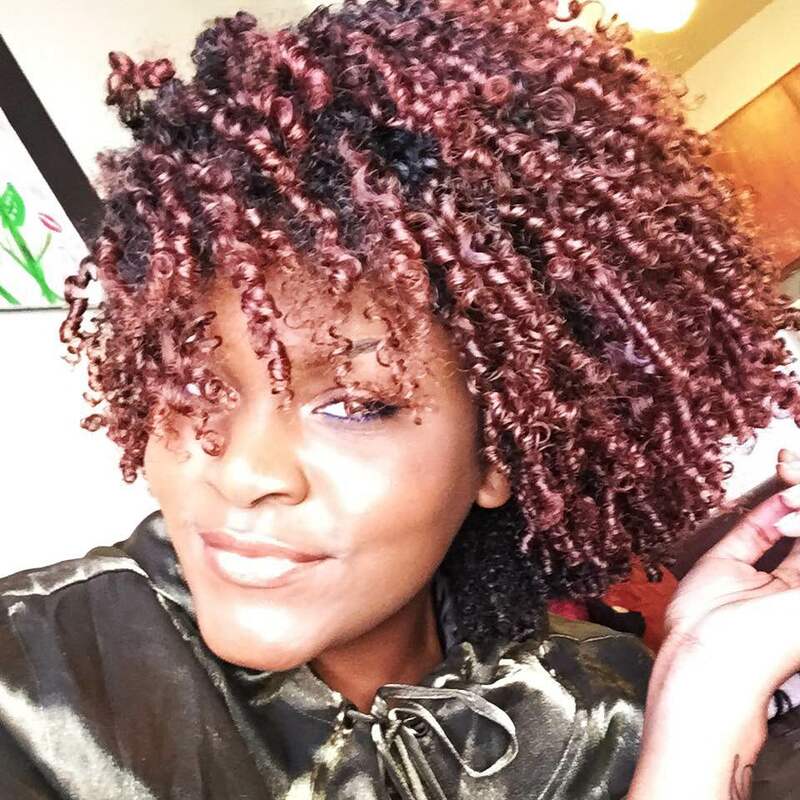 For any of my natural ladies who are finding themselves at a road block with their hair, temp color is a definite fun and simple way to jazz up your fro.